dress.htm">Useful Addresses page. Please look there before contacting me - Ed. Coro Gabriel are a Sardinian 'choir' - that is, a group of singers dedicated to performing the ritual music of a particular geographical location. In Sardinia, such rituals are usually of a religious nature. Many village churches and religious foundations still have such confraterniteor 'brotherhoods' , and some stunning examples of their music can be heard on Le Chant du Monde's CD 'Polyphonies de la Semaine Sante'(LDX 274 936), recorded by Bernard Lortat-Jacob in 1985/91. However sacred the repertoire may be, it owes its existence and quality of performance to intensely persued social practices, as might be expected. The Brotherhoods are lay associations whose main aim might be said to be 'personal development' - expressed through devotional acts and charitable social service. They comprise a group of men, from all social strata, who attempt to preserve the community's cohesion and culture, and who dedicate themselves to the requirements of the socio/religious rituals. These include more than 80 feasts in the religious calendar, and up to 50 funeral/mortuary rites, which require formal singing. At Castelsardo in the north of the island, the number of active brotherhood members is around 50, and well over half are singers. Yet, in Holy Week, it is usual for the size of the choir to be limited to four - bassu, contra, bogi, falzittu. Combinations of four singers tend to emerge who specialise in one particular piece, and whose vocal characteristics most perfectly match the perceived requriements of that piece. 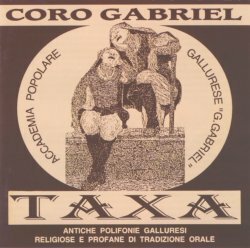 Coro Gabriel are a secular group, who perform the music collected by the great Italian ethnomusicologist Gavino Gabriel - 1881-1980. It's also possible that they are what we would call revivalist, if that means anything in Sardinian terms, where the musical traditions are still very much part of everyday life in the villages. I say possible, because the booklet tell us almost nothing of the choir or its repertoire. There are ten singers, but I don't think more than 5 or 6 perform together at any one time. They include a trippi - contralto - as an addition to the Castelsardo model. It also tells us nothing of the musicians - a band of ghironda, organetto, chitarra and percussion play two short pieces at the start and finish of the CD, and provide a light accompaniment to one of the songs. These additions seem, to me, to add nothing to the enjoyment of the whole - they only serve as an intrusion. Only 3 of the 11 pieces are religious, but the style is very homogeneous (except for the accompanied song and one faster piece) and you wouldn't easily tell the difference - unless you were easily able to distinguish between the Sardinian and the Latin texts. The singing is wonderful, and the style will undoubdtedly be new to you. It may not have quite the edge of the traditional stuff (the quintina is rarely heard), but it's very approachable - and will be absolutely thrilling to a first-time listener. This CD is thoroughly recommended, and makes a good way in to the rather more meaty fare on the Chant du Monde disc. Taxa is distributed by Robi Droli - thus by ADA in the UK. Sadly, the booklet also contains no photos.